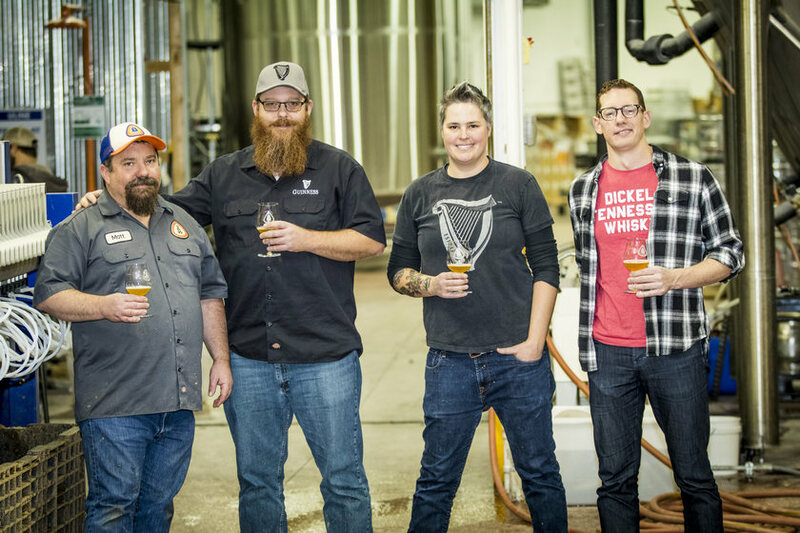 Nashville, TN – Tennessee Brew Works, Guinness Open Gate Brewery & Barrel House, and George A. Dickel & Co. have collaborated to create a beer that celebrates the Scots-Irish heritage of Tennessee. The release will be at Tennessee Brew Works, downtown Nashville, on Monday April 30. Named Sinsear, the Gaelic translation of ‘roots’, the beer is an Imperial Irish Red Ale that was infused with lemon zest and ginger and aged for five months in George Dickel Superior Number 12 Whisky barrels. The result is a smooth, rich beer at 8.5% abv, reminiscent of a Tennessee Mule cocktail, which was inspiration for the brewers. This collaboration was over a year in the making and culminated with Guinness Open Gate Brewery & Barrel House Brewmaster Peter Wiens and Head Brewer Hollie Stephenson traveling to Nashville and joining Tennessee Brew Works’ Head Brewer Matt Simpson, brewers Andy Bohleber and Stephanie Smith, and George Dickel’s Brian Downing, to create this complex and delicious cocktail beer. There will be two events to celebrate the release on April 30. Tennessee Brew Works will host an Irish Breakfast from 8am, with a keg-tapping event at 11am and featuring beer cocktails and music. 4/30/18-The Filling Station East 3-7pm. 5/1/18- Von Elrod’s Beer Garden and Sausage House 4-7pm. 5/3/18- Jack Browns Beer and Burger Joint. 5-9pm.